Do I need to trigger compaction on my databases? No, Cloudant automates compaction for you. Customers using a dedicated cluster can tune the priority of compaction against other database operations. The compactor is not exposed to end users. Can I monitor the status of view building? In your user dashboard, select the database you wish to examine. Then click on the 'stats' tab. Here you will find information about that database including the progress of view builds. You will find a progress bar for each view group showing how many documents have been indexed and how many remain. Can I insert/modify/delete multiple documents at once? Yes you can, use the _bulk_docs end point. How do I control access to my databases? Access is granted per database. By default, all databases are only accessible to your account. You can give people read, write or admin privileges. Users are identified by either a Cloudant account name, an API key or are in a catch all "everyone else" group. Can I use vhosts with Cloudant? Yes! You can map your own domain (or subdomain) to your Cloudant server, or a path within it. Look for the "virtual hosts" section at the bottom of your dashboard page. The _changes feed from Cloudant looks weird, what gives? The _changes feed is not guaranteed to return changes in the correct order. This is a consequence of clustering and is expected behavior in a distributed environment. Moreover, sequence "numbers" are actually generated strings in Cloudant, so it's not a good idea to rely on them for any information. How does Cloudant's sharding work? 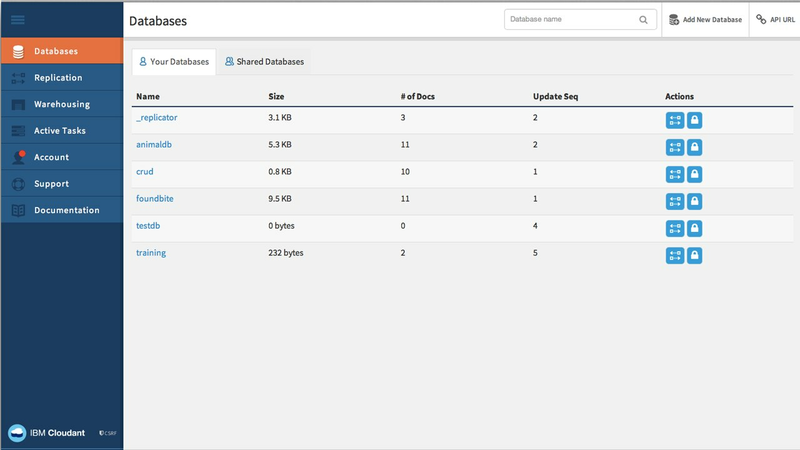 Cloudant takes your databases and distributes them over many nodes. This will allow you to scale your databases past what can be held on a single server. We also distribute copies of your documents over a number of servers such that your data is always available, even if a node goes down. API keys allow you to give access to a person or application without having to create a new Cloudant account. An API key consists of a randomly generated username and password, and appropriate access permissions. Once generated, an API key can be used the same way as a normal user account.